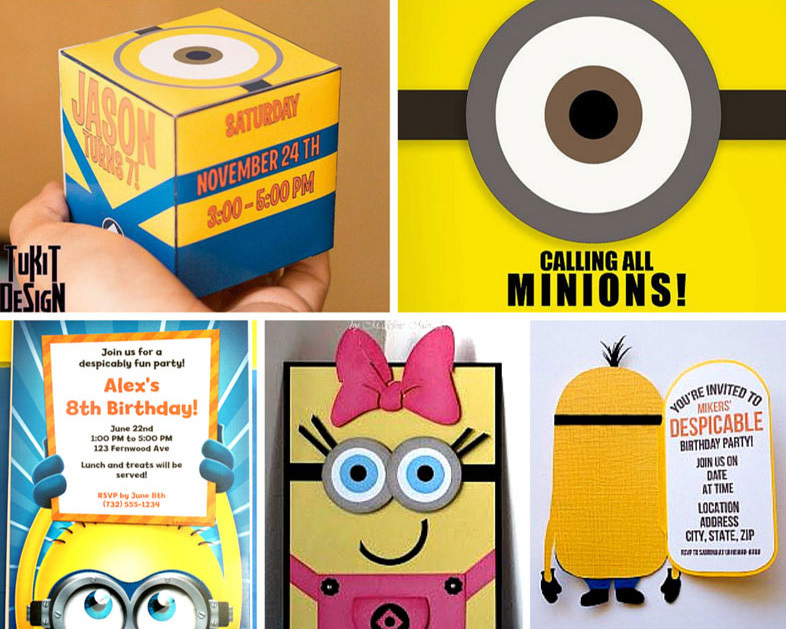 Make a minion from yellow construction paper or card stock. Cut out white circles for the eyes. Draw on goggles and faces with black marker. Cut out blue overalls and glue on Minion. Write party details on the back. Purchase yellow latex balloons in medium size. Using a black sharpie marker, draw minion goggles and faces and write out the party details. Allow to dry then un-inflate the balloon. Place balloon in an envelope with a note instructing guests: "Gru says, I'm afraid your invitation met my shrink ray. Blow up this balloon and join my Minions"
Order a personalized Minion Banner to celebrate the occasion. Some additional themes from the movie are unicorns, moons, ballet, kittens and fun weapons. Make large cut-outs of minions, unicorns and kittens and attach to doors and walls. 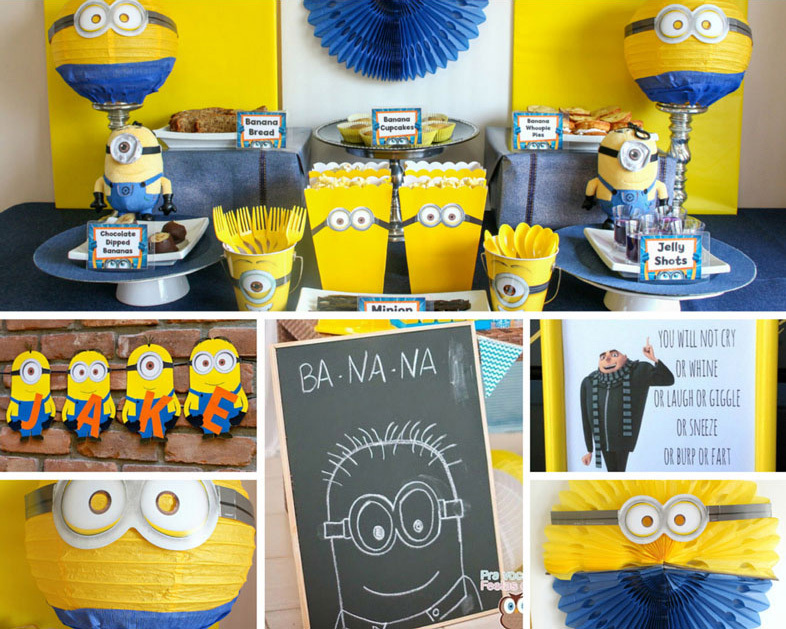 A Despicable Me Pinata filled with favors and candy doubles as an activity and a decoration. Yellow and blue jelly beans in glass vases make a sweet addition of color to the room. Stick 1 yellow and 1 blue paper fan together to make it more minion like. With solid color table ware, stick with yellow, blue, black and white. 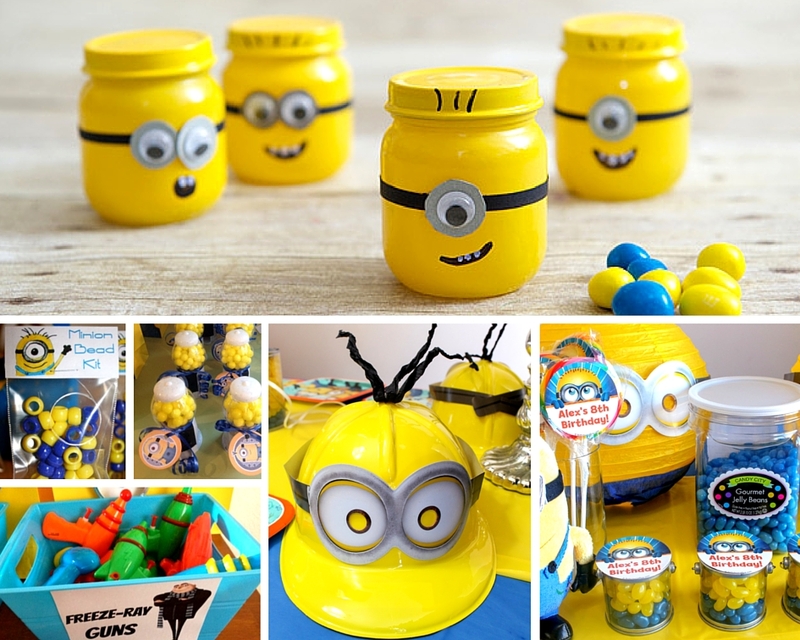 With themed table ware, our Despicable Me Standard or Deluxe kits give you everything you need. Mix it up. Coordinate themed tableware with solid napkins, cups or plates. Customize the look with DIY ideas for napkin rings, cup sleeves or centerpieces. Serve your guests popcorn while they gather for a showing of Despicable Me. 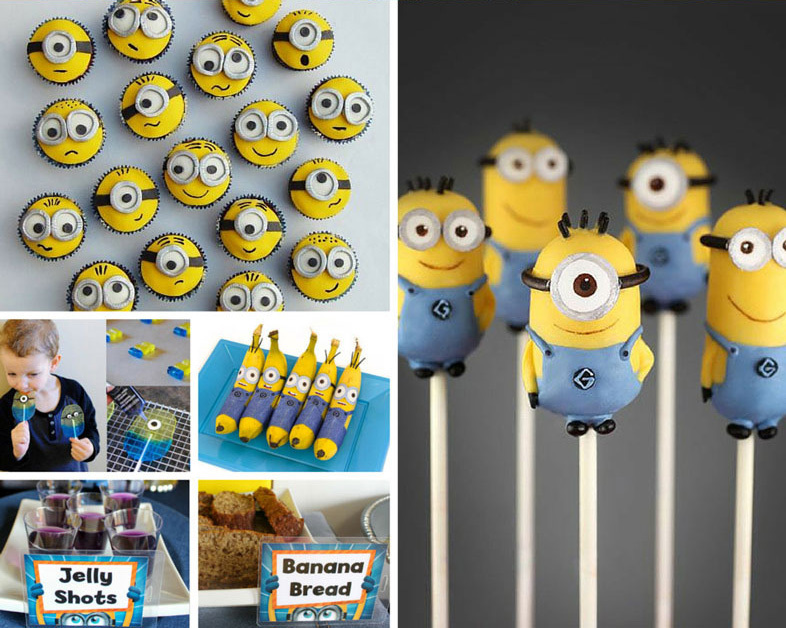 Decorate them ahead of time to look like minions. Gently push a skewer through two donuts carefully so as not to break the donut. Keep the donuts close together to resemble goggles. Put a popsicle stick through the flat bottom. This is best to do while some of the peel is still on the banana so you have something to hold. Melt chocolate or white chocolate using your favorite recipe. You can also use candy melts in various colors. Blue would resemble the overalls the minions wear. Dip the banana in the chocolate. Place the bananas on wax paper and freeze until ready to eat. Put marshmallows on a stick and dip them in yellow candy melts. Use these as little snacks or cupcake toppers. Ask your family members to participate variations of this classic party game. Everybody is a winner with these versions of Bingo! Make balloon animals or swords! Who's the fastest at your party? You'll find out! Use the links below to quickly find related theme party supplies, planning tips, printable checklists, and advice from our party planning experts. Party Planning 101: Our useful party planning guide includes cake ideas, party etiquette tips, a printable guest list, and much more. Birthday Party Decorating Ideas: This guide will tell you how to decorate for your party theme, what to do with balloons and streamers, how to decorate with food, how to set the table, and how to make your own party decorations. Parties Under $100: Use this guide to celebrate in style without breaking the bank! Party Budget Estimator: Download this guide to help budget your expenses.